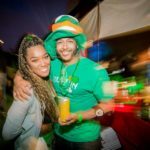 San Diego shamROCK is where you want to be to celebrate St. Patrick’s Day! 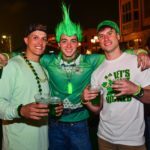 Saturday, March 16 from 2 pm to Midnight the Gaslamp Quarter becomes an emerald paradise carpeted in over 80,000 square feet of green AstroTurf for San Diego’s largest St. Patrick’s Day block party! 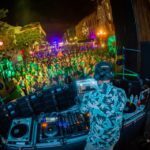 San Diego shamROCK boasts three stages of non-stop music that will get you jigging like a leprechaun that has found a pot of gold at the end of a rainbow! 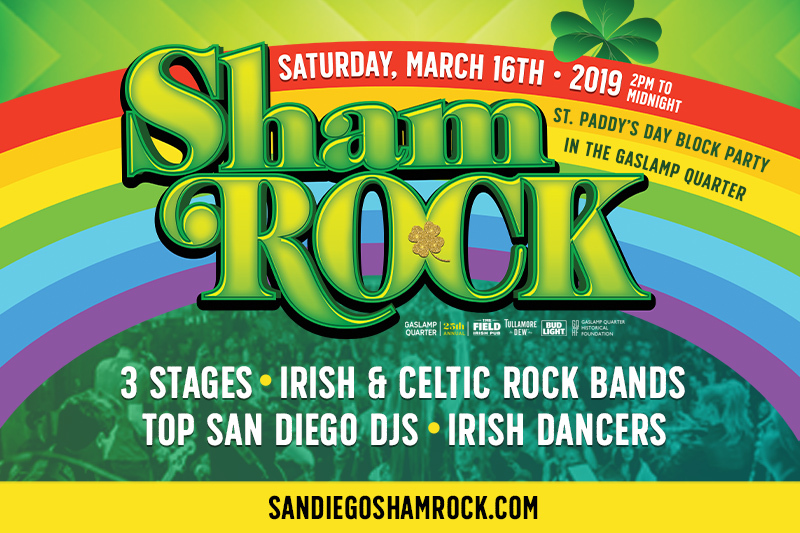 Get to shamROCKIN’ at The Pub Stage, The Pint Stage, and The Clover Stage featuring jam-packed lineups of Celtic and Irish Rock bands, Top DJs, and your local favorite San Diego DJs! As luck would have it, San Diego shamROCK has added two extra hours to the Irish shenanigans this year! Plus check out all-new new Shenanigans Block, featuring games, photo ops, an interactive mural, and contests! Test your Irish skills at the shenanigans showdown and win a clover medal to commemorate your victory! From 3 pm to 9 pm The Pint Stage will light up with Stein Holding Contests, Irish Jig Offs, Magical Chairs, Unicorn Races, and a Rainbow Streamer Relay Race. Not only does your San Diego shamROCK wristband give you access to 80,000 square feet of AstroTurf, live entertainment, green Bud Light Beer, Tullamore Dew Whiskey libations and the all-new shamROCK Shenanigans Block, but attendees to the event can also take advantage of St. Patrick’s Day specials and no cover charge from over 25 participating restaurants and bars located throughout the Gaslamp Quarter for just $35 through Midnight on March 3rd. Choose to enhance your San Diego shamROCK experience with a Custom Clover Crew Package with prices ranging from $7 to $30. With a Custom Clover Crew add on you can get complimentary beer, a 32-ounce commemorative 25th shamROCK stein, St. Patrick’s Day hat, Lucky Line entry, access to designated Clover Crew only restrooms, and a Commemorative Credential! Now that’s something to shake your shamROCKs for! Go VIP for an elevated shamROCK experience that you won’t forget for just $80 through Midnight on March 3rd! With a VIP wristband receive all the GA benefits and so much more! As a Lucky Leprechaun VIP, you get access to the exclusive VIP Lounge, $1 off all drinks at the VIP lounge Bar, VIP restrooms, and complimentary drinks! VIPs receive 7 complimentary drinks; 3 at the Lucky Leprechaun VIP bar within the shamROCK venue and 1 drink at each VIP hotspot. San Diego shamROCK is strictly 21 and up, all attendees must present valid photo ID to enter the event.